The tombs are located in a cemetery for noblemen and top officials on the west bank of the Nile River. The 18th Dynasty’s period was from 1550 B.C. to 1292 B.C. It is the period that saw one of the few women to rule Egypt, Hatshepsut, who took over as pharaoh after the death of her husband and oversaw many building initiatives. The 18th Dynasty also saw the rule of perhaps the most famous of all pharaohs today: Tutankhamun, whose parents were brother and sister. 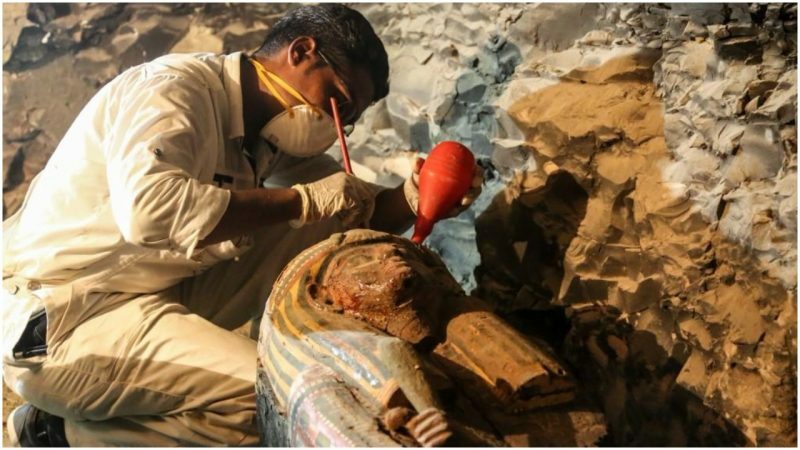 According to the Independent, Mostafa Waziry, who is leading the excavation, said he believes the finding of the two tombs to be related to one that was announced three months ago. That important tomb Hawass described as “the discovery of the year.” It contained a goldsmith named Amenemhat who lived 3,500 years ago, along with other mummies and artifacts. And that is not all. This has been a year of discoveries, Egyptian officials say. Other interesting finds were a Roman-era mass grave near Minya and a previously unknown pyramid at the necropolis in Dahshur. This year also saw the unveiling of a 26-foot-tall statue of King Psamtek I in a suburb of East Cairo. The two tombs most recently opened have been known about since the 1990s. They were surveyed and numbered at that time by German Egyptologist Friederike Kampp-Seyfried. The first tomb, known as Kampp 161, was never opened at the time, while the second tomb, identified as Kampp 150, was only excavated to its point of entrance. Recently the tombs were re-discovered and excavated by Egyptian archaeologists. The leading theory is that Kampp 150 dates to the reign of Thutmose I—abo0ut a century earlier than Kampp 161—based on evidence found in the tomb. Thutmose is a prominent and particularly aggressive pharaoh who in his second year of a reign that lasted about a decade led a river-borne expedition deep into Nubia, seeking the rich gold deposits of the country. Later in his reign he also pushed his way into Syria. Foreign archaeological expeditions have been well known for over a century, but in recent years Egyptian scientists have come to the fore. Antiquities Minister Al-Anani said the discoveries and the publicity about the tombs are part of his department’s efforts to promote Egypt’s once-thriving tourism industry, which in the past was in part supported by antiquities sightseeing. Tourism has been hit hard by extremist attacks and political turmoil following the 2011 uprising. According to the Independent, there is speculation that Al-Anani is using “the power of Egyptian monuments” to bring the country’s fascinating past back into the forefront of what people think of when they hear about Egypt.